I will be in the Town of Bunia Monday – Friday, February 23-27. I will leave our place in Nairobi at 5 AM on Monday morning and be in Bunia about noon. The purpose of the trip is contingency planning. It is a well-defined process for identifying and ranking the dangers in a specific environment, finding ways to mitigate them and then making plans for each danger in case it happens. The dangers range from acute sickness or accident to armed robbery to civil war. We will be doing a part of the process with Congolese who know their environment better than we do. This exercise sets the stage for our placing more and more people in the Congo including Dayle and I and moving our office entirely into Congo. Pray that we will have wisdom, insight and a process in which our relationships and words please the Lord. I hope to update this blog every day of the week in the evening Congo time, so in the morning US time. These are some of the participants at the risk evaluation phase of the contingency planning. 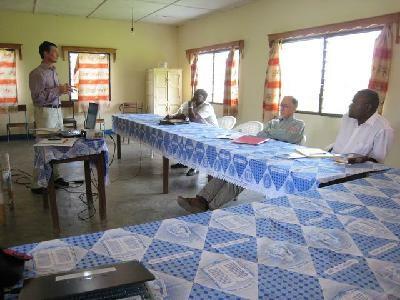 We are working with Congolese colleagues and Congolese from churches we work with. They know the situation best and can therefore best help us determine which risks are the most likely. The Rector of the university has me staying at his house across the street form the University. It has simple furnishings. 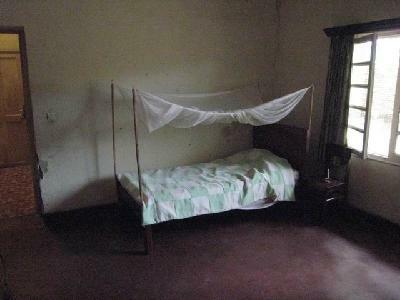 My rooms is simply furnished but it has all that I need, including the most important item – a mosquito net to protect me from Malaria. 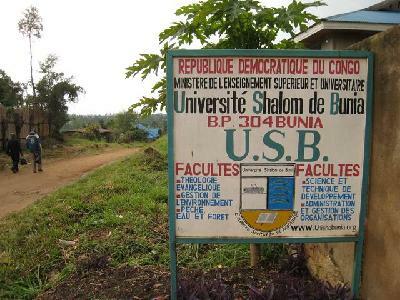 The Shalom University of Bunia is hosting our contingency planning. It is a Christian university and the one which offers a degree in Bible translation. We helped with the definition of the curriculum for that degree and we find funds to provide scholarships to worthy students. This entry was posted in Bible translation, Congo, National translators and tagged Bilbe Translation, Bunia, Congo, contingency planning, Democratic Republic of Congo, Shalom University of Bunia. Bookmark the permalink.